Presented by Ben Serebin www.reefsolutions.com Tue, June 15, 2005. Every 2 nd Tuesday of the Month. Same Time and Place Visit www.nyexug.com for Presentation. 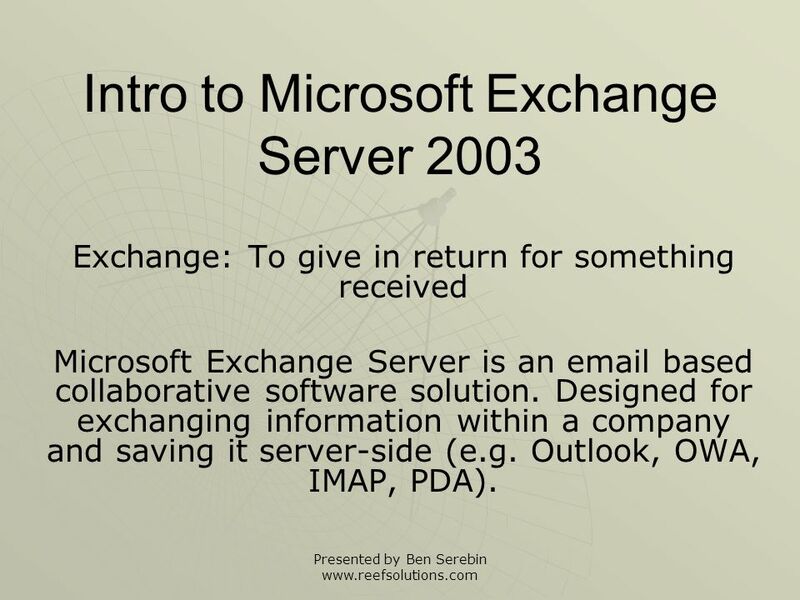 3 Presented by Ben Serebin www.reefsolutions.com Intro to Microsoft Exchange Server 2003 Exchange: To give in return for something received Microsoft Exchange Server is an email based collaborative software solution. Designed for exchanging information within a company and saving it server-side (e.g. Outlook, OWA, IMAP, PDA). 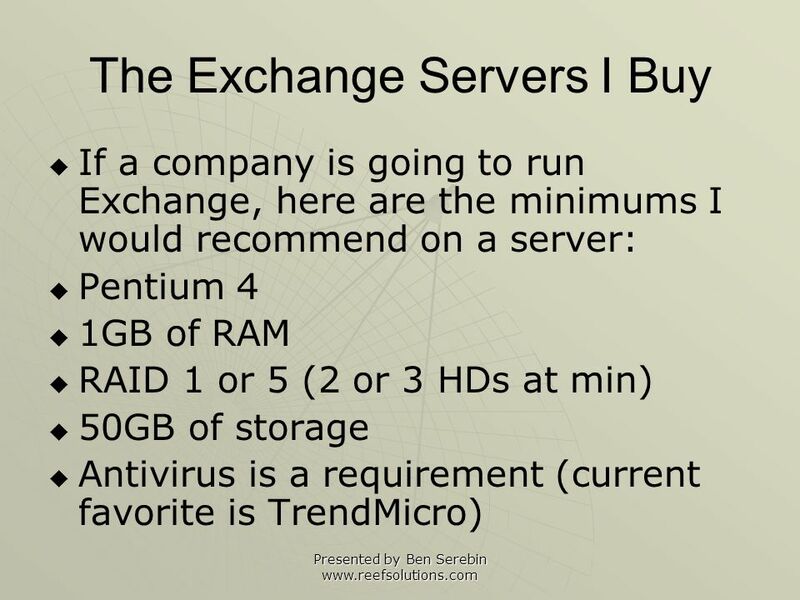 8 Presented by Ben Serebin www.reefsolutions.com Lets Get Exchange Running… Ideally install Exchange on a separate server from the DC. 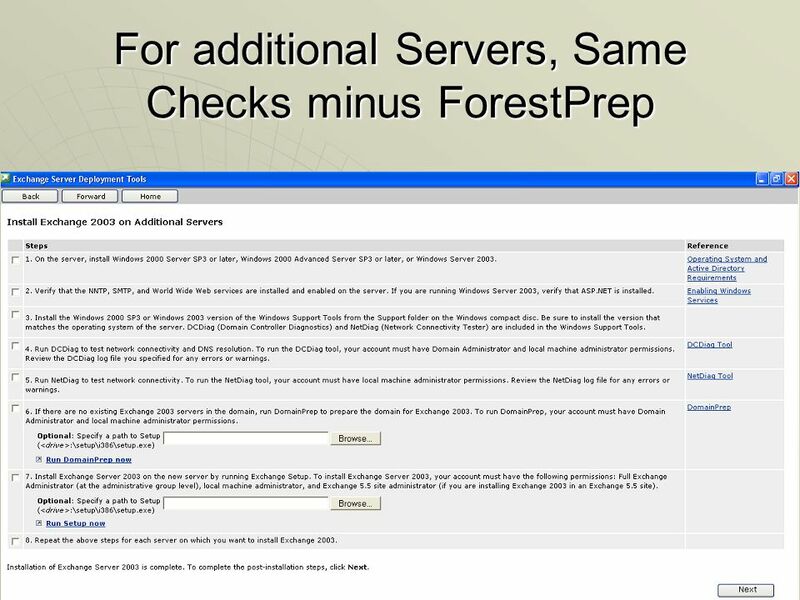 To get the most functionality, install on Windows Server 2003. 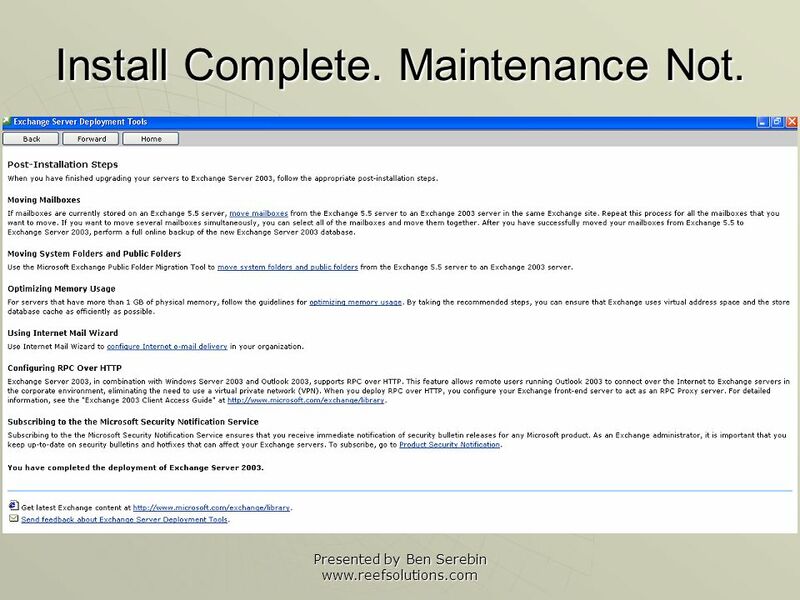 Select Exchange Deployment Tools to get Exchange up and running. 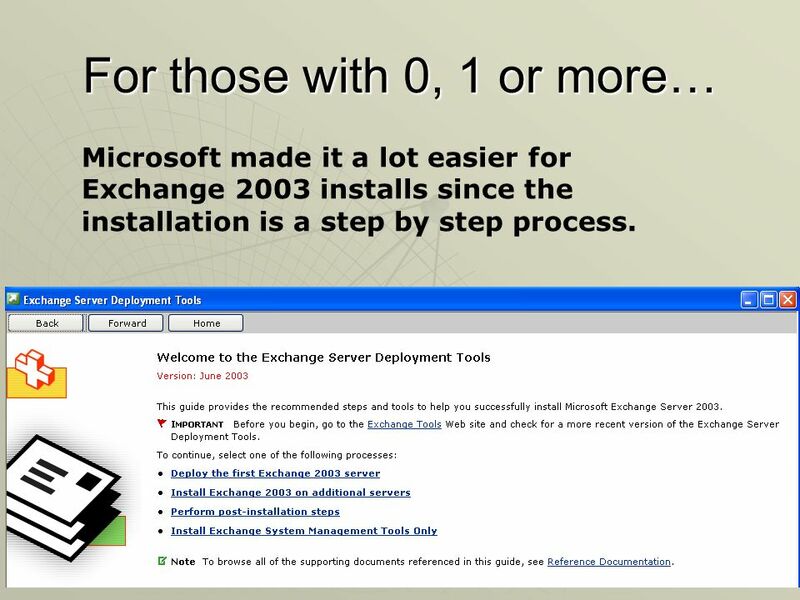 9 Presented by Ben Serebin www.reefsolutions.com For those with 0, 1 or more… Microsoft made it a lot easier for Exchange 2003 installs since the installation is a step by step process. 13 Presented by Ben Serebin www.reefsolutions.com Install Complete. Maintenance Not. 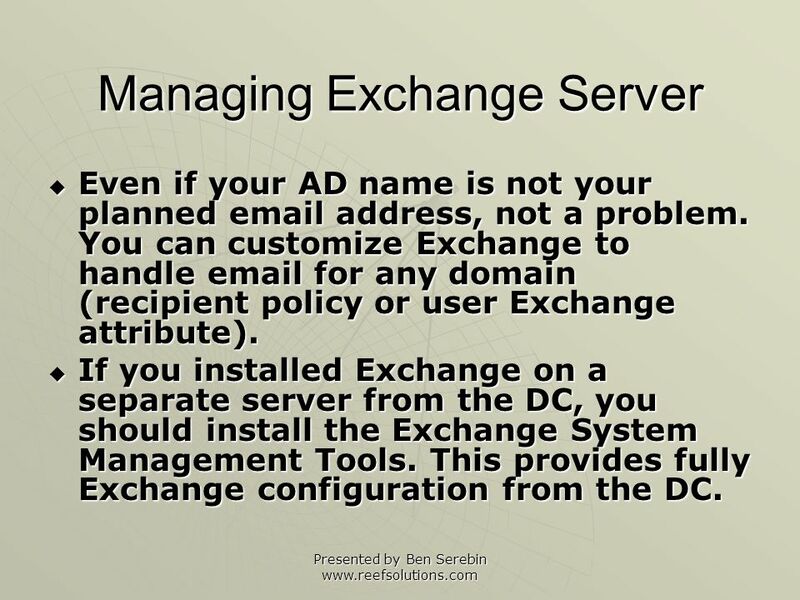 14 Presented by Ben Serebin www.reefsolutions.com Managing Exchange Server Even if your AD name is not your planned email address, not a problem. You can customize Exchange to handle email for any domain (recipient policy or user Exchange attribute). Even if your AD name is not your planned email address, not a problem. 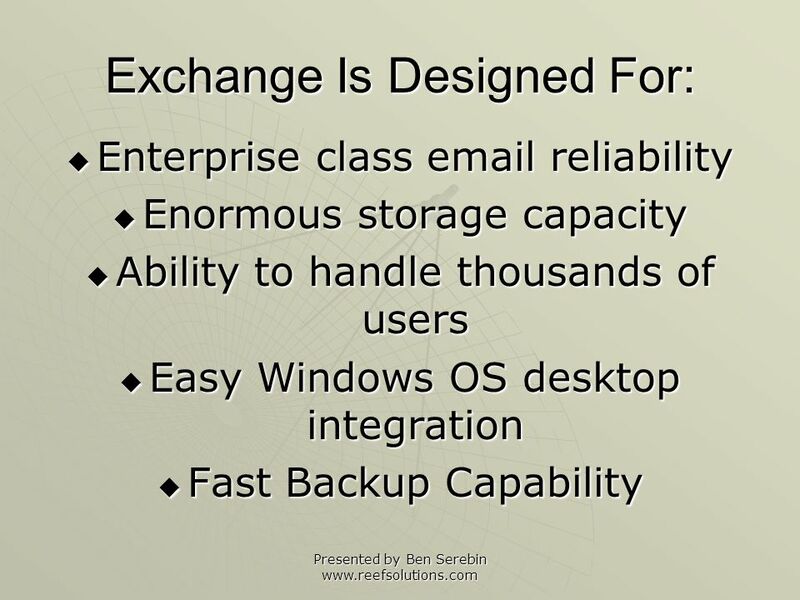 You can customize Exchange to handle email for any domain (recipient policy or user Exchange attribute). 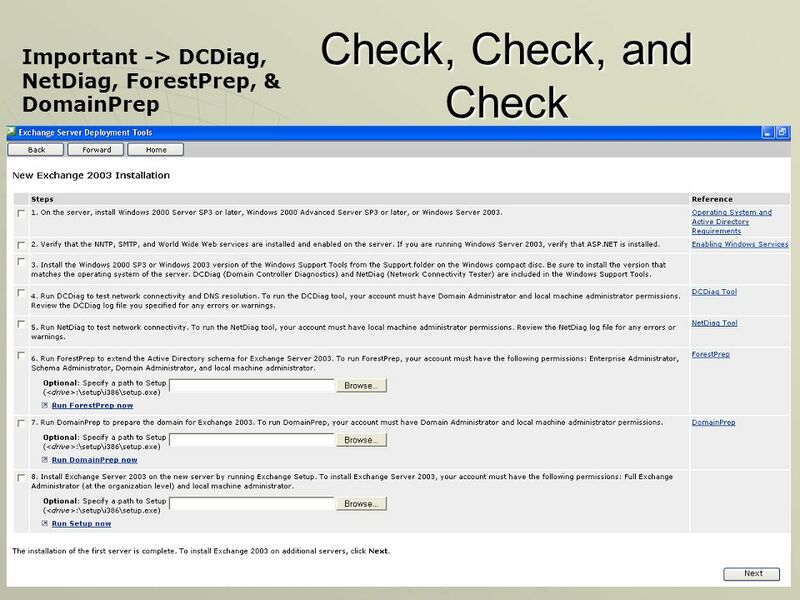 If you installed Exchange on a separate server from the DC, you should install the Exchange System Management Tools. This provides fully Exchange configuration from the DC. 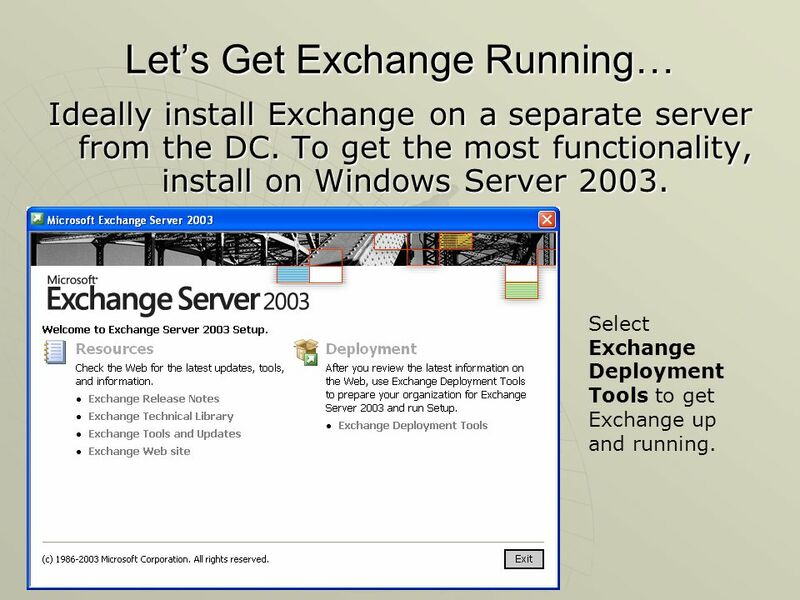 If you installed Exchange on a separate server from the DC, you should install the Exchange System Management Tools. This provides fully Exchange configuration from the DC. 16 Presented by Ben Serebin www.reefsolutions.com Lets Talk Domain Name System (DNS) Install Exchange and your done. NO! Install Exchange and your done. NO! 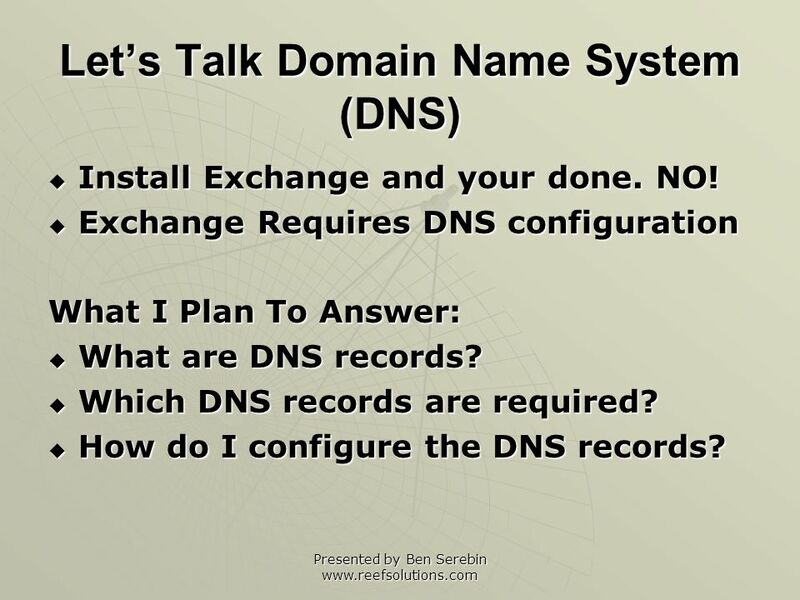 Exchange Requires DNS configuration Exchange Requires DNS configuration What I Plan To Answer: What are DNS records? What are DNS records? Which DNS records are required? Which DNS records are required? How do I configure the DNS records? How do I configure the DNS records? 17 Presented by Ben Serebin www.reefsolutions.com DNS is the answer. 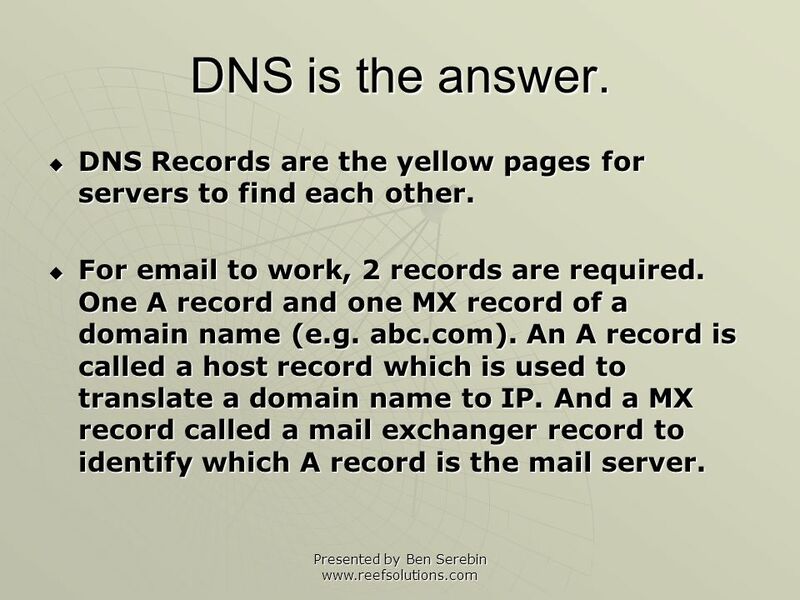 DNS Records are the yellow pages for servers to find each other. DNS Records are the yellow pages for servers to find each other. For email to work, 2 records are required. One A record and one MX record of a domain name (e.g. abc.com). An A record is called a host record which is used to translate a domain name to IP. And a MX record called a mail exchanger record to identify which A record is the mail server. For email to work, 2 records are required. One A record and one MX record of a domain name (e.g. abc.com). An A record is called a host record which is used to translate a domain name to IP. And a MX record called a mail exchanger record to identify which A record is the mail server. 18 Presented by Ben Serebin www.reefsolutions.com A + MX = Email A record configuration for abc.com: mail.abc.com 1.2.3.4 1.2.3.4 would your Exchange Servers public static IP. 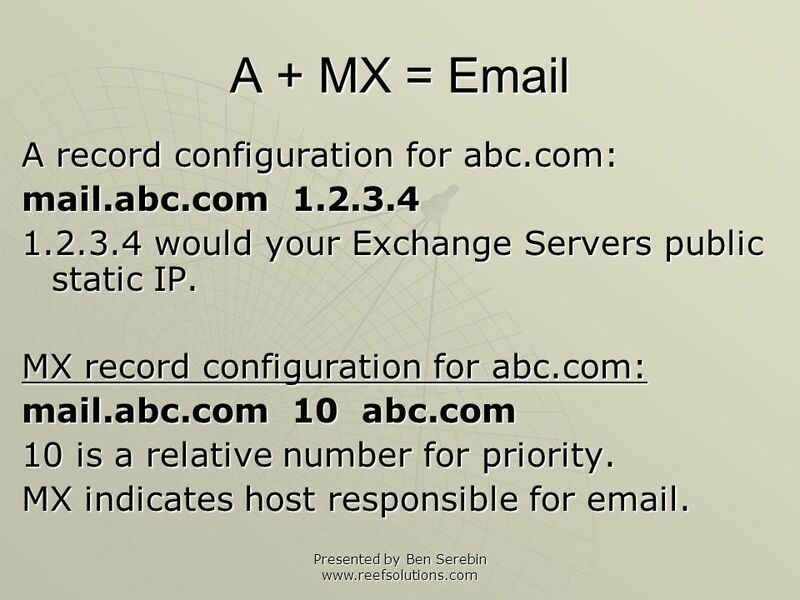 MX record configuration for abc.com: mail.abc.com 10 abc.com 10 is a relative number for priority. MX indicates host responsible for email. 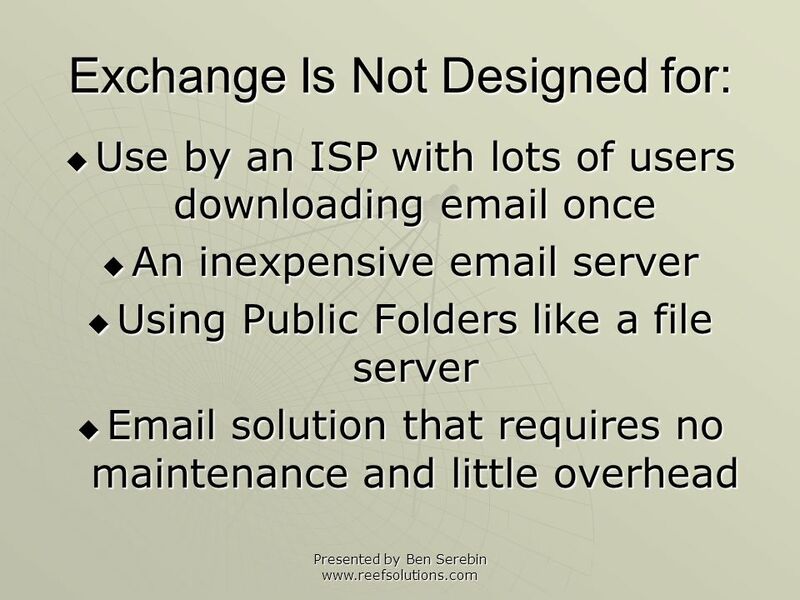 19 Presented by Ben Serebin www.reefsolutions.com And All the Fine Print… And the firewall YOU are running needs to be forwarding SMTP (port 25) to the Exchange Server. And the firewall YOU are running needs to be forwarding SMTP (port 25) to the Exchange Server. Make sure you apply all the latest OS and Exchange updates. Make sure you apply all the latest OS and Exchange updates. Buy that SSL certificate for OWA. Buy that SSL certificate for OWA. Backup, Backup, bring off-site. Backup, Backup, bring off-site. Is your anti-virus updated? Is your anti-virus updated? Monitor your install to insure uptime. Monitor your install to insure uptime. 20 Presented by Ben Serebin www.reefsolutions.com Conclusion Now you know about Exhange 2003 and DNS configuration for email servers. 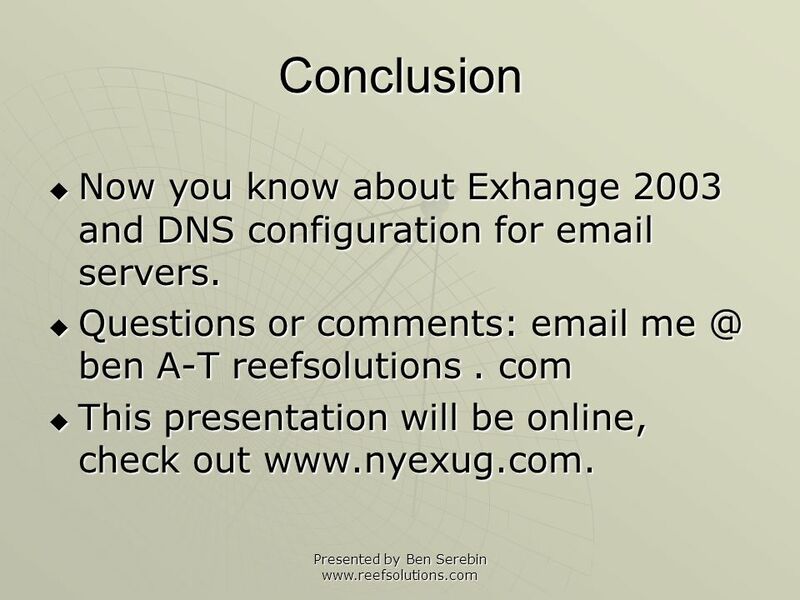 Now you know about Exhange 2003 and DNS configuration for email servers. Questions or comments: email me @ ben A-T reefsolutions. com Questions or comments: email me @ ben A-T reefsolutions. com This presentation will be online, check out www.nyexug.com. This presentation will be online, check out www.nyexug.com. Download ppt "Presented by Ben Serebin www.reefsolutions.com Tue, June 15, 2005. Every 2 nd Tuesday of the Month. Same Time and Place Visit www.nyexug.com for Presentation." 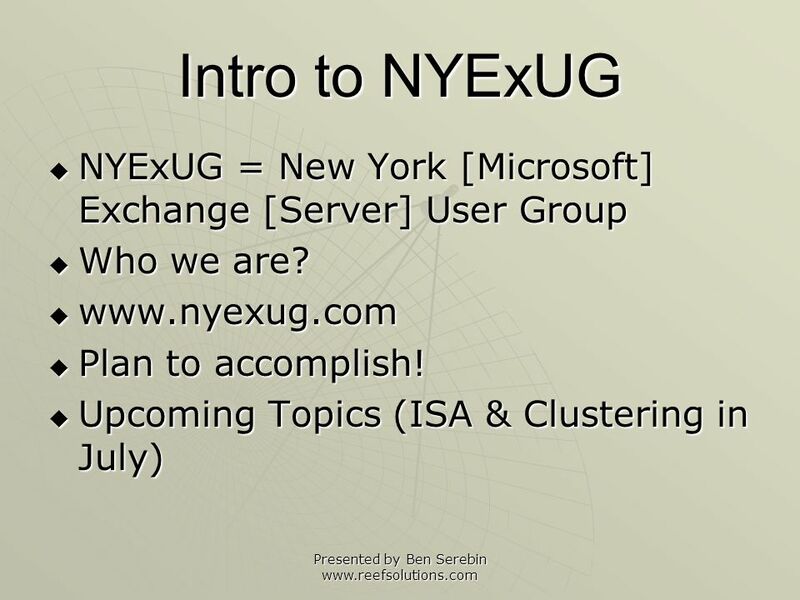 What is the New York Exchange User Group (NYExUG.com)? Ben Serebin Ehlo & Network Consultant REEF Solutions ben a t reefsolutions. c o m If you cant get. Whats New in Microsoft Office 365 Module 01 | Daniel Sierra | Account Technology Strategist Microsoft Education México. Grass Valley Learning Center Surf the Net Safely Roger Thornburn. Karam al-sofy & Faten alhasan. Overview HMailServer is an server for Microsoft Windows. It allows you to handle all your yourself without. WSUS Presented by: Nada Abdullah Ahmed. 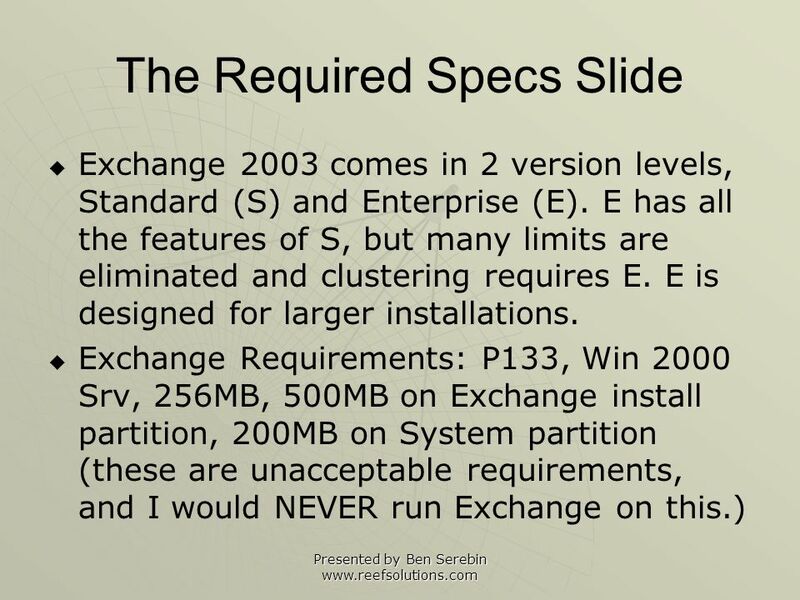 Exchange 2003/2007 Upgrade Path Recommendations to 2010 Additional reference information can be found in the back of the presentation on Noted References. Exchange server Mail system Four components Mail user agent (MUA) to read and compose mail Mail transport agent (MTA) route messages Delivery agent. What’s New in WatchGuard XCS 10.0 Update 3 WatchGuard Training. 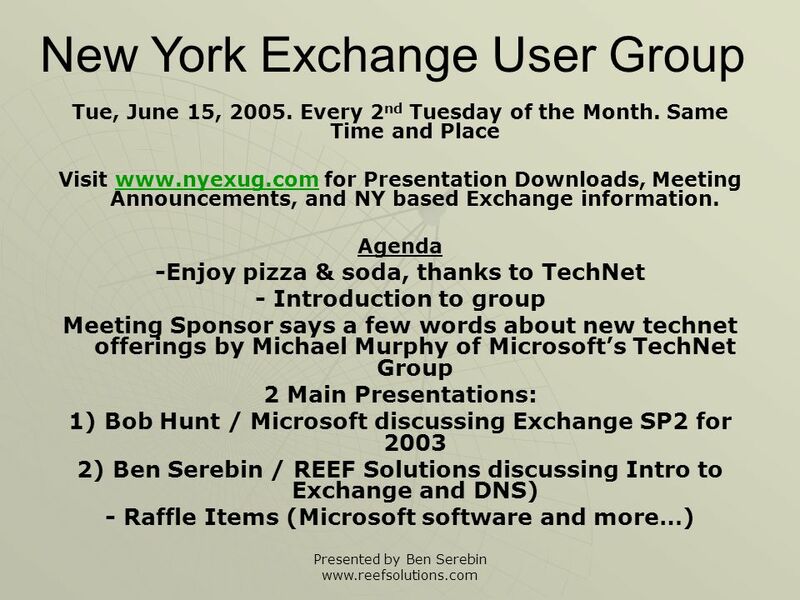 August 8, 2006 for NYExUG Presented by Ben Serebin Welcome to the 1.5 years anniversary meeting. Tue, August 8, Every 2 nd. Windows 2008 Overview Lecture 1. Windows Networking Evolution Windows for Workgroups – peer-to-peer networking built into the OS Windows NT – separate. Windows Small Business Server 2003 Setting up and Connecting David Overton Partner Technical Specialist.